briancarper.net (λ) - VMware: What's in a name? VMware: What's in a name? VMware never ceases to confuse me. Not the program, which is a pretty good piece of software. Just the name of everything. Look at this list of VMware software; can you figure out what any of those things are via their names? The VMware official site is no less confusing. Hilariously, all of these things seem to be named different things than a year or two ago when last I tried to install VMware. It seems this company, like many others, enjoys renaming everything at random, just to keep you on your toes. In some cases, multiple packages have the exact same copy/pasted description, which is awesome. But maybe the Gentoo devs couldn't figure out what any of these things are either. After some trial-and-error I narrowed it down to vmware-server, vmware-player and vmware-workstation. I think vmware-workstation is the non-free one, so that narrowed it down to the other two. vmware-server required me to register at the VMware site and download something myself, after giving my name and shoe size and blood type to VMware and registering, then clicking a download link in an email. Then vmware-server installed via Portage OK. But it comes with a horrible web-only interface and the OS runs in a browser plugin. This crashed hard and often. I'd like a standalone client please. There's vmware-server-console in Gentoo which sounds like it should let you connect to vmware-server, but ha ha, no, it doesn't. At least not the versions I ended up with via Portage. Then I read somewhere that you can't use VMware Server Console to connect to VMware Server 2.0, it only works with earlier versions. I think? I don't even know if this is true, all I know is vmware-server-console froze or crashed no matter what I tried. I read on some random mailing list that you can use something called "VMware Infrastructure Client" to connect to VMware Server, but I couldn't for the life of me determine what this is or where to get it. So I uninstalled vmware-server, made sure to rm -rf /etc/vmware /opt/vmware /var/lib/vmware first, and then installed vmware-player. This opened in a GTK2 GUI, which is what I wanted to begin with. But I couldn't create a new image. I could only open existing ones, which I could download from the official VMware site apparently. Anyways, it seems that they only added the ability to create your own images in VMware Player version 3.0; this feature was absent in previous versions. And 3.0 is not available through Gentoo yet. So I uninstalled everything, rm -rfed any cruft I could find, and went and downloaded VMware Player 3.0 from the VMware site directly. I had to register AGAIN, but then I got it. During the install, VMware Player 3.0 asks you for the location of your runlevels directory. It didn't accept /etc/runlevels on my box; I guess Gentoo's is non-standard. So I had to make a fake directory and go into it and mkdir rc0.d rc1.d rc2.d rc3.d rc4.d rc5.d rc6.d init.d and let VMware pretend that was my runlevels directory. All so the installer could spew an initscript into it, which doesn't even work. Oh well. After trying to run vmplayer, failing because the kernel modules weren't loaded properly by the broken initscript, modprobeing the modules myself and restarting a bunch of times, then running vmware-networks --start manually, behold! I had a running VMware Player 3.0 and I made my own image and everything was good. Are you confused yet? It's all free, so I guess I shouldn't complain. But I guess I just did complain anyways. Names don't have to be this confusing. So many companies do this, and why? How about "light" (or even "lite"), "trial", "full", "free", "paid", "server", "client"? Those are nice words. We all know what those words mean. "VMware ESXi" might sound EXTREME or trendy or whatever, and maybe it really does "Deliver Enterprise Performance to Your Applications" (ugggggggggggh), but what the hell is it? What is VMWare ThinApp? What does it do? How am I supposed to buy what you're selling when you're speaking a foreign language to me? Did you also consider qemu? It is easy to use. I don't know how it compares to vmware in terms of performance. LMAO! Awesome! I agree crazy names! And crazy website... Hate the whole registration thing, but sometimes I think if you look hard enough there's a link to skip the registration. I looked at the Gentoo Wiki page for VMWare and decided not to go that route. Installed Virtualbox instead and I love it! I use VMWare Server on my Windows box at work. Version 1.x had the console. I'm not crazy about the web interface but I guess it's useful if you want to check your vms remotely. I have VMWare ESXi running on an old server as it requires actual server hardware. You have to use VMware Infrastructure Client to connect to it. Just use VirtualBox - works very well with Gentoo. If all you were looking for was to create a VM and use it locally for Windows/Other Linux Distro VirtualBox would have been a lot easier. 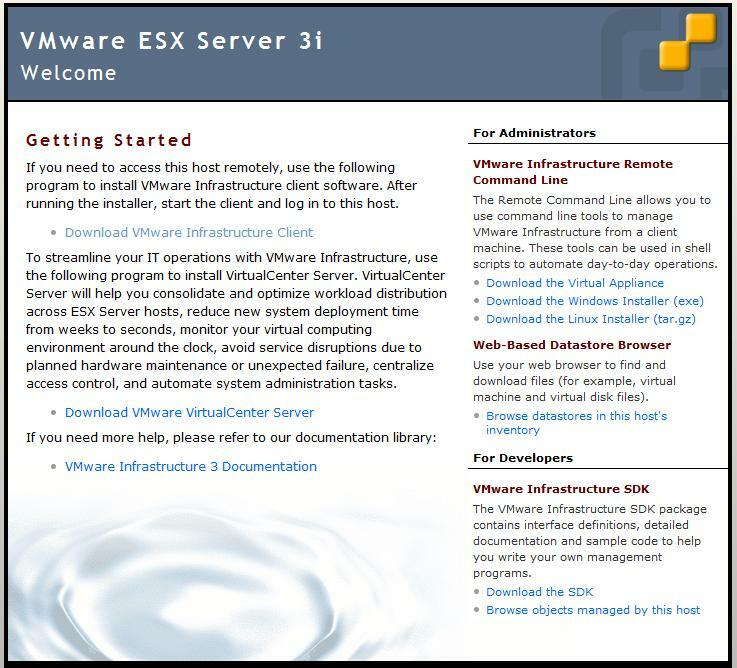 vmware-server runs locally on your workstation and can be accessed via the web interface. vmware-esx(i) is a RedHat based distro that takes over your server entirely (i.e. it's the only operating system that can run on the server) and can be accessed via an Infrastructure Client. vmware-vcenter can only be installed on a Windows server and it can connect to multiple ESX servers to control them and deploy VMs on them. In other words, VirtualBox would have probably been an easier alternative (unless you really needed vmplayer for your work). VMWare definitely let a terribly nontechnical marketing department run wild over their entire product line. I spent a week trying to decipher their web site a while back and figure out what all the stuff was. Even reading the descriptions carefully it's hard to tell sometimes. I'm pretty sure most of their site was written by a marketing department that doesn't actually know what the software does. Please, if anyone from VMWare reads this.. for the love of god get someone, anyone, technical into your marketing department and start rewriting. The current site is worse than nothing. I do know this much. VMWare ESX and ESXi completely take over your machine. They boot and run underneath everything else. If the software doesn't support your hardware directly, you're out of luck. The good thing is it's supposedly very efficient. The rule of thumb is you can run 4 VM's per core on ESX and only 2 on the other VMWares. What most people think of as VMWare is called VMWare Server now. It was called VMWare GSX, then they decided to give it away but since GSX had such a good reputation they were worried people would think it was too good and not buy ESX so they renamed it VMWare Server. They aren't supporting it as well and seem to be trying to give people reasons not to run it but it's free and other than terrible client support, it runs great. It will start VM's on boot and let you log in and remotely administrate them. Once you configure it right, it's pretty good stuff. Too bad they tossed their very good thick client out the window with 2.0. Since they had already written all that code it was a pretty terrible decision. VMWare Workstation is the same as it used to be. You can't manage virtual machines remotely and as far as I know, you can't set them to start at boot. You also have to pay for this one, but it will run on XP Vista. It's dumb. Use VirtualBox instead. VMWare Player is like workstation only you can only run VMs other people have made. It's dumb, use VirtualBox instead. The other stuff is just ways of pulling gobs of money out of companies over and over. Want to manage a bunch of ESX boxes from one place? $2k + $2k per box plus $2k per box for this feature, and $2k per box for that feature, etc etc... I didn't need anything that stuff provided so I didn't get too deep into it. Hm. Actually, as far as I heard, vmware has the highest performance passthrough. But you should really see if maybe VirtualBox or QEMU are enough for you, too. They are both open source and free (though VirtualBox also has a closed source edition). The latest qemu with KVM extensions in in Fedora 12 is comparable to any vmware product I've used and we currently have vmware-server, ESX and ESXi in house.